Greatness is not allied to rank alone, nor is heroism to blood. The noblest of the Pilgrims of Plymouth was sprung from the people. For generations the little farming village of Austerfield, a royal manor of the West Riding of Yorkshire close to the Nottingham line, had known the family of Bradfurth or Bradford as a race of tenant-yeomen who, besides tilling the lands of the Mortons, possessed also a freehold of their own. But no man or woman of the Bradford name had given it prominence or worth until, on March 19, 1589, William Bradford was born in that low-roofed farm-house on the great plain of York. Puritan writers speak of Austerfield as a "profane and irreligious" village in which was to be found "no bible and a careless priest." Whatever the facts, the environments, undoubtedly, were not such as would suggest the making of a leader or the development of a religious nature. But we are assured that, before the age of twelve, the boy William Bradford, brought up in that Austerfield farm-house "in the innocent trade of husbandry," displayed alike a thoughtful temperament and "a pious mind." At sixteen he fell, in some unknown way, under the influence of one of the much-maligned Puritan preachers of Scrooby, a Nottinghamshire village but a few miles from Austerfield. As a result he gave up his farming-life, left his Austerfield home, and in the face of bitter opposition, distrust, censure, and persecution, joined the Puritan church and settlement at Scrooby, established there by William Brewster, the postmaster of Scrooby and a prominent leader in the new sect of dissenters from the English church, known first as separatists and, later, because of their frequent changes and wanderings, as Pilgrims. From his earliest association with this feeble and despised communion, William Bradford was zealous in his readiness to stand boldly for his faith, whatever the risk involved. 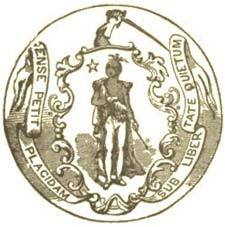 He was one of the first to appreciate the real meaning of the struggle; he saw that dissent implied not alone a religious opposition, but a political defiance as well, and that its followers, braving the will of England's royal bigot, James Stuart, and denying his assumption of the divine right of kings, would ere long do open battle in the cause of the people against despotism, and stand for that deeper question of liberty which the Pilgrims of Scrooby and Leyden first fully grasped. Bradford was one of that venturesome company which, in 1607, embarking at Boston, in Lincolnshire, sought to flee from English tyranny, and find a home in Holland. They were betrayed, turned back, and imprisoned. The next year this young eighteen-year old enthusiast escaped from his jailers, and made his way to Amsterdam. Here he apprenticed himself to a silk-weaver, and became an efficient member of the association of English exiles in Holland. Upon his coming of age in 1610, he sold off the Austerfield lands that had descended to him upon the death of his father, and entered upon an unsuccessful business investment in Amsterdam. This failing, he joined himself to the Pilgrim colony that Brewster and Robinson, the Pilgrim preachers, had established at Leyden. When those far-seeing reformers awoke to the fact that an English-speaking community in Holland must, in time, become Dutch in manners, speech, and life, and looked across the western ocean with the dream of founding a religious republic of English-speaking folk in the New World, Bradford was one of the most earnest in adopting and carrying out their views, and was one of that famous company which, on September 16, 1620, sailed from Plymouth in England, to cast anchor, three months later, in the harbor of the new Plymouth in New England. It has been said that if William Brewster was the Aaron of the Plymouth enterprise, William Bradford was its Moses. Certainly he was, almost from its inception, its leader and deliverer. It was his brain that conceived and his hand that executed that memorable compact which the forty-one earnest men signed in the cabin of the Mayflower, as she rode at anchor in Provincetown harbor--"the first instrument of civil government ever subscribed as the act of the whole people." It was into his hands, when Carver, the first governor, died of sunstroke in the spring of 1621, that the colonists gave the guidance of their affairs, electing him governor of the Plymouth colony on April 21, 1621--"the first American citizen of English race who bore rule by the free choice of his brethren." More than this, we may look upon William Bradford, so says Mr. Doyle, the English historian of the Puritan colonies, "as heading that bead-roll of worthies that, from his day, America has never wanted--men who, with no early training in political life, and lacking much that the Old World has deemed needful in her rulers, have yet, by inborn strength of mind and lofty public spirit, shown themselves in all things worthy of high office." Certainly William Bradford showed himself worthy the trust and confidence of his fellows. For nearly forty years he filled the office of governor of the Plymouth colony. His hand guided it through the perils of its early years, his brain planned that systematic development of its slender resources that made it the one successful episode in America's beginnings. His treatment of the Indians was always firm but friendly; his dealings with the grasping "London adventurers," whose greed would have seriously crippled the colony had it not been for his restraining hand, were courteous but convincing; it was Bradford who led the colony from the unsatisfactory communism of its first years to the system of individual property that, from 1623, held sway, and turned an uncertain venture into a career of industrial prosperity. Always tolerant, never injudicious, and alike pure-minded, liberty-loving, courageous, and wise, no hand could have better guided than did his, or have more systematically shaped, the destinies of the infant State. The testimony of contemporaries and the judgment of historians unite in crediting to William Bradford that rare combination of intelligence and industry, of judicial and executive ability, by which a small and obscure band of persecuted fugitives laid in an unexplored wilderness the foundations of a great and prosperous commonwealth. His methods were as simple as was his own noble nature. Each advance was the outgrowth of his own observation and the colony's necessities, and while the corner-stone of the community was religion, he stood himself for religious liberty, and never permitted the zeal of his associates to degenerate into intolerance and persecution. 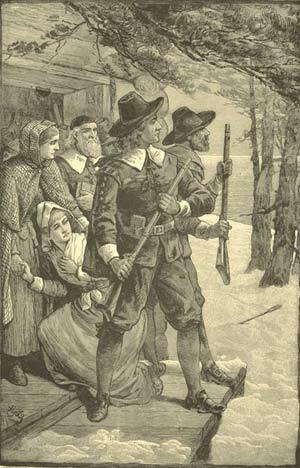 While other of the early American colonies were narrow, bigoted, and vindictive, it is to the credit of the Pilgrim colony of Plymouth that the cargo of the Mayflower contained no seeds of persecution, and throughout the long administration of Governor William Bradford the colony he guided had, in his time at least, a clear comprehension of the meaning of religious and political freedom, and did not descend into the harrying of so-called heretics, the scourging of Quakers, nor the burning of witches. Whatever intolerance of this sort may, at a later day, have stained the records of the colony, was of foreign growth and contrary to the heritage of charity left by William Bradford. This willingness to serve, to spend and be spent, is apparent throughout the whole story of Bradford's life. It displayed itself in the boyish spirit of renunciation that led him to join the Scrooby society, and held him loyal to his association even through imprisonment and persecution, through exile, flight, and emigration. Again and again through his long service as governor of the Plymouth colony, he wished to lay aside the burden, but always yielded to the wishes of his comrades. Elected by the suffrages of his associates, he himself restricted his own authority by the formation, in 1624, of the governor's council of five members, increased in 1633 to seven, in which the only privilege held by the governor was a double vote. In 1624 he with seven of his associates assumed, what was for that day and the uncertainties involved, a great risk, and bought out the "London Adventurers" who had so feebly backed the colonists. In 1629 he obtained a patent that conferred upon himself, his associates, and assigns the title to the whole Plymouth tract, and in 1640 he conveyed this valuable title to the colony, reserving only his personal proportion as a settler. It was this unselfishness of disposition, this loyalty to duty--accepting honors as trusts and burdens as obligations--this union of justice and faith that made William Bradford great and kept him noble. "With malice toward none, with charity for all," even as had that great American of two centuries later, Bradford could keep the even tenor of his way in the midst of obstacles and discouragements. Unmoved by the ingratitude of Weston, the insolence of Morton, the treachery of Oldham and Lyford, and the selfishness of Allerton; calm amid the controversies brought about by the arrogance of the greater colony of Massachusetts Bay, the encroachments of the French in Maine, and of the Dutch on the Connecticut, he could yet, when occasion demanded, display that stern justice that meted out the extreme penalty of the law to offenders, and condemned to death Billington, the first murderer in the colony, and Peach, the assassin of a defenceless Indian. William Bradford is one of the most interesting figures in the history of New England. He is the noblest of the Puritans--a type of their best element, an exponent of their highest effort, a pioneer in their struggle for liberty for justice, and for law. The boy who could brave opposition and contumely for conscience's sake, could also be of gentlest manners and serenest mood when called to lead and govern those who put their trust in him; the same native courage and independence that held him loyal to his convictions in his early years made him, when responsibilities multiplied and burdens were laid upon him, the very staff and hope of the Pilgrim colony of Plymouth. He combined with executive ability other notable gifts. Though bred to the soil in an age when the farmer was a drudge and had no ambition beyond his crops, he yet, when opportunity offered, applied himself to study with such good results that he was learned in Latin, Greek, and Hebrew, and conversed in French and Dutch. He was acquainted with the history and philosophy of his day, was deeply versed in theology, and even attempted poetry. He wrote much and well. His most important production was his "History of the Plymouth Plantations"--a detailed chronicle of the history of the Pilgrims from 1608 to 1646. Carried away from the old South Church by British soldiers, it was completely lost, until almost providentially discovered, though partially destroyed, in the shop of a Halifax grocer, and to-day it tells us almost all that we know of the Plymouth settlers, from the day when they left Lincolnshire till they became a prosperous commonwealth in America. Of this important contribution to American history, Mr. Doyle, the English historian, says: "Gratitude is quickened when we compare the simple, vigorous, and picturesque chronicle set before us by Bradford, with the tedious and pedantic writings from which so much of the later history of New England has to be extracted.... His work is in the true sense scholarly. The language is like the language of Bunyan, that of a man who trained himself not merely to speak but to think in the words of Scripture. Every expression is simple and effective, never far-fetched, never mean nor common. The substance is worthy of the style. Faults no doubt there are ... yet with all its defects Bradford's writings still remain the worthy first-fruits of Puritan literature in its new home. They are the work of a wise and good man, who tells with a right understanding the great things that he and his brethren have done." The wise governor was loyal to his colony to the last. He resisted the ambition to take larger holdings of land and become great estate owners that influenced Standish and Brewster, Alden and Winslow, and other of his Mayflower companions, drawing them away from Plymouth to the broader acres at Duxbury and Scituate and Marshfield. The governor deplored this withdrawal as a desertion on the part of his old friends, and a menace to the welfare of the colony. He lived on in Plymouth, where his home on Leyden Street, still standing, gradually outgrew its early primitive dimensions as became the house of the governor of Plymouth. Here he died on May 9, 1657, "lamented by all the colonists of New England as a common blessing and father to them all," and the only special memorial that tangibly recalls his fame is the unpretentious obelisk on Burial Hill. As Miles Standish and John Alden had a romance in their lives that has made them historic, so this Puritan governor of Plymouth had his. His first wife, gentle Dorothy May, was drowned in Cape Cod harbor while her husband was away exploring the new-found coast. He had married her in Leyden in 1613 and less than three years after her death, on August 14, 1623, he married Mistress Alice Carpenter Southworth, who in earlier days, it is alleged, had been young William Bradford's "dearest love." She came across the sea--at his call--a widow, to marry the widowed governor of Plymouth and thus complete the unwritten romance begun in his earlier years. A self-made man, a scholar of repute, a writer of renown, an upright and fearless magistrate, a model citizen, a courageous leader, gentle, just and generous, practical and wise, William Bradford stands in history as the essence and exponent of what was best in the Puritanism of his day, the architect and builder of a God-fearing, independent, and progressive community that, throughout the ages, remains the most notable because the most typical of the foundation-stones that underlie the mighty structure of the Republic of the United States of America.